I am a massive fan of what Nintendo have done with the creation of the Switch. They basically pointed out to the world that life is better when you have more flexible gaming options, and I love it. 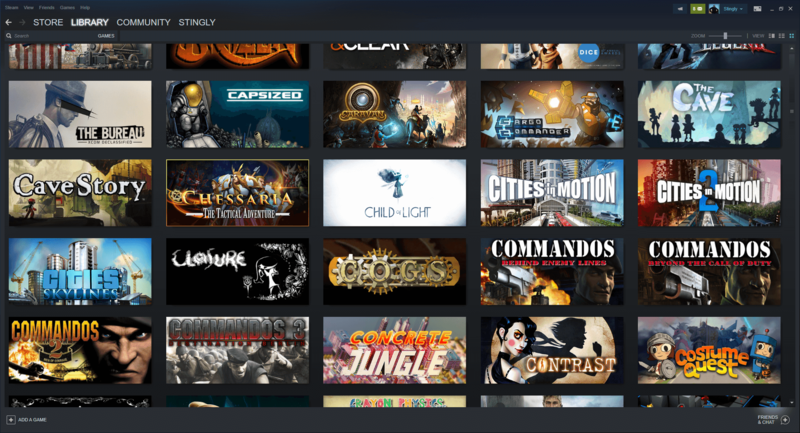 Too many games to replace! There have been a number of possible solutions to this problem over the years. Anyone remember the Smach Z? This was alleged to be a scam, but looks like it might actually come to market and it could be the answer to my prayers — apart from the price! What about the GPD Win 2? Well, I can tell you that this looks like a very tempting little device, but also rather expensive — at $649 during the campaign and a whopping $899 afterwards! Anyway, I already own the hardware I need to play my games; I just want to be able to get to that machine from an alternative device, like I do with the Steam Link. Smach Z vs. GPD Win 2. But wait! What’s this in my pocket? Why, it’s a mobile phone! It has a screen and I can use it to play games, so can I use it to get onto Steam? OK, so most people in this situation just Moonlight and use Nvidia Gamestream to achieve what I want to achieve. Trouble is you need a fairly up-to-date Nvidia graphics card and I have an AMD Radeon. So I guess I’m stuffed, yes? Well, no. As it turns out, there is another way… I can use Parsec. 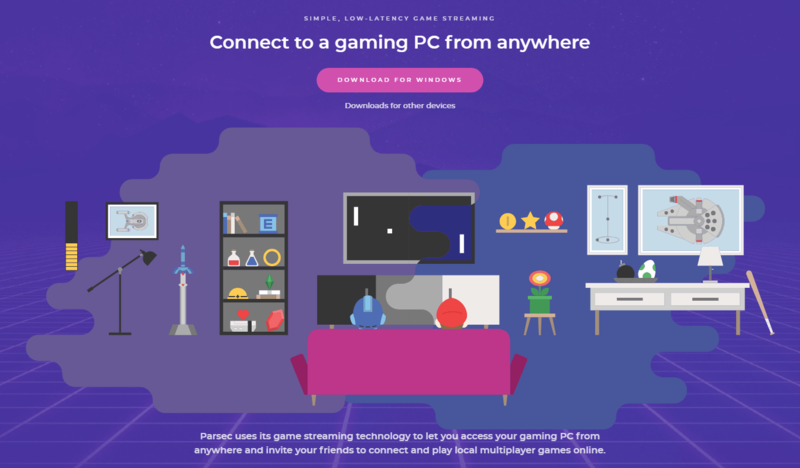 Parsec connects two devices to let you play your PC games from anywhere on any device. Play your games from the couch, work, or a friend’s basement. …and I’m sure it probably would be if I was using any sort of conventional set up. 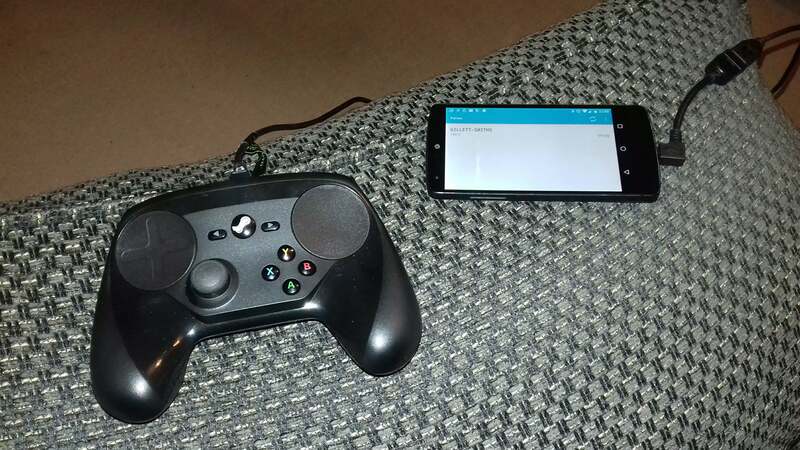 For example, my mate installed Parsec on his gaming tower at home (with an AMD card in it) and was able to connect and play games immediately on his phone… sort of. He didn’t have any input devices to hand, so he was only able to look at his desktop — but he could click on things and it did open Goat Simulator! It’s now two weeks later and I am the proud owner of a five-year-old ‘gaming’ PC. It’s not bad, with an i7 CPU, 16GB RAM and a 240GB SSD, but the graphics card is certainly past its best. Will Parsec play ball? Short answer: Yes… kind of. I can fire up Parsec on my phone and connect to my new PC — it works, my phone works, my controller will control the PC through Parsec via my rather DIY setup and there is very little sound or input latency. The display, however, runs at about 1fps. Totally unusable. My test rig running Parsec and a wired Steam Controller. And with that, my dream died. 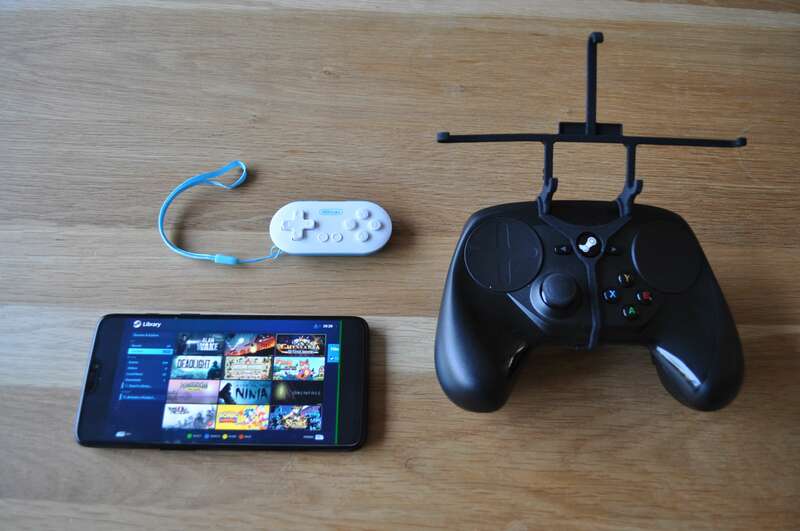 I was unwilling to sink any more time into Parsec and for three months I was denied any (more) gaming flexibility… until one day, Valve announced the Steam Link App. 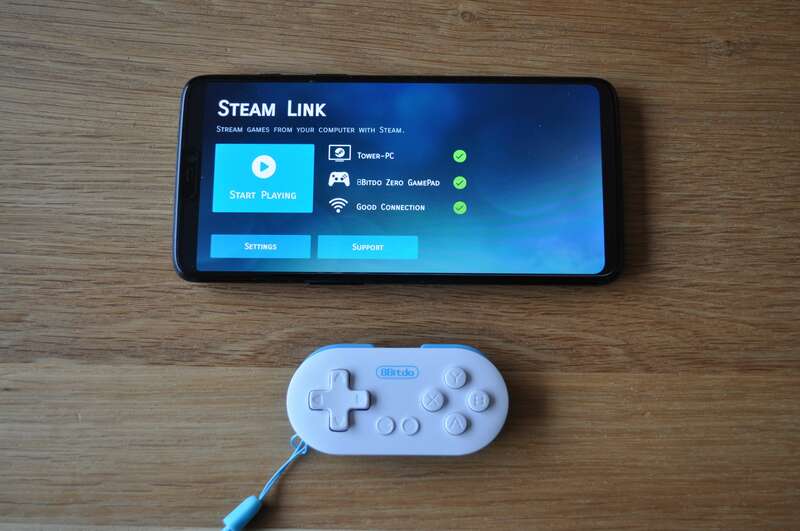 This wonderful little application basically mirrors the functionality of the Steam Link, but running on your phone. Of course, you still need a controller to play your games (though it does support basic touchscreen functions) so Valve updated the firmware on their Steam Controller to turn on Bluetooth. 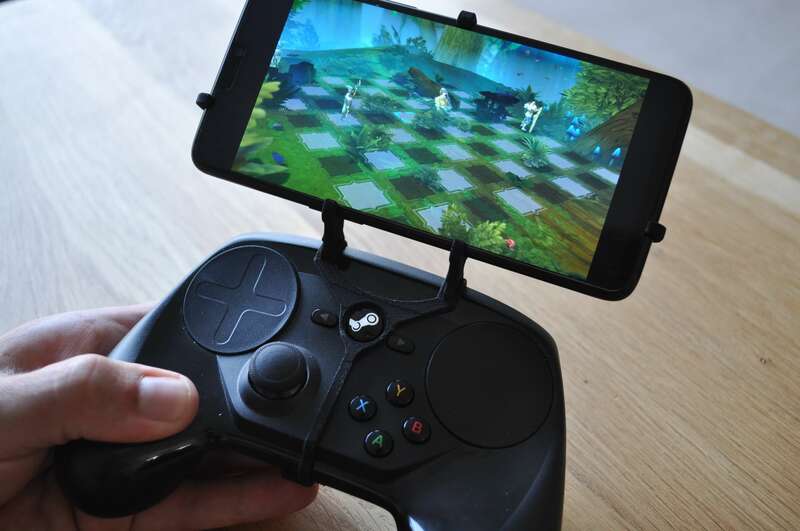 Now I’m able to pair my Steam Controller to my phone and my phone to my PC through Steam itself and everything just works! With the phone on the same network as my PC, gaming is smooth and unfaltering. The final solution works brilliantly! After a lot of Googling, I purchased a ‘Front Rider’ from UtorCase. This delicate and fragile-looking thing is actually incredibly strong and robust. 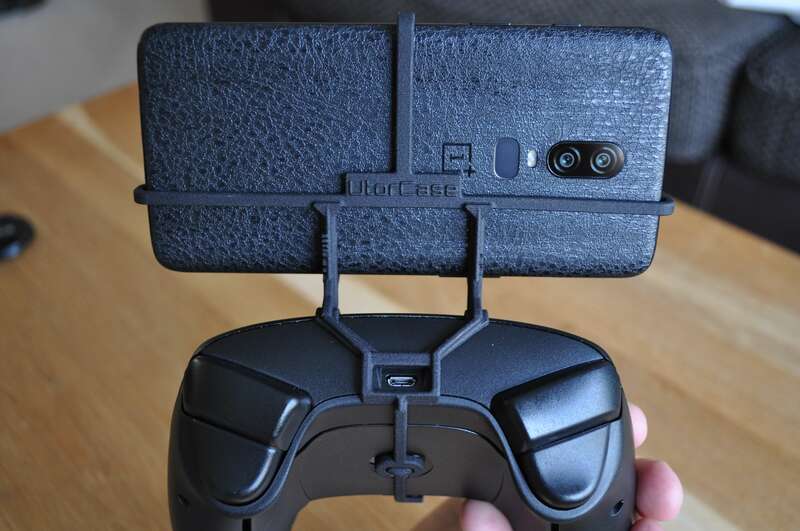 It fits to the Steam Controller perfectly and holds my OnePlus 6 (the more observant of you will notice the phone upgrade from my original test rig) firmly in place. I am really impressed with the build quality and attention to detail that the creator has put into this mount, and would heartily recommend them. I love my UtorCase mount. My second ‘discovery’ was the lack of ability to play games from a remote location, which is to say ‘not on my local network’. This wasn’t actually part of my original requirements, but sometimes you just want to bust out your phone and have a quick game when you’re out and about. The Switch can do this (obviously), so why can’t I? Fortunately, it turns out I can with a bit of basic tinkering with the settings on my router. I’ve written a guide on how to set up the Steam Link App to work over the Internet, in case you want to do the same. Following almost directly on from this comes my third problem: the Steam Controller is a bit bulky to lug around with you everywhere you go. My solution? Buy another controller! The 8BitDo Zero is the perfect companion for most of my gaming needs when away from home, and can be bought fairly cheaply. It’s not quite small enough to fit on my key chain (though you could do this if you want to), but it’s small enough to easily fit in my pocket or bag, the battery lasts for ages and it charges over USB. The question is, does it work? Well, yes and no. My original requirement was to play PC games on a second screen in the lounge whilst my wife uses the TV. This works perfectly — though with the caveat that some games with small UI elements can be a little challenging to operate. Also, controller support on some games is either non-existent or lacklustre, but using Steam and the Steam Controller does circumvent this quite well and a decent experience can easily be had with a little remapping of buttons from the built-in controller settings menu in Big Picture mode. Basically, if you are happy playing a specific game with your controller at the moment, this solution will work fine. My secondary requirements have been accomplished similarly well, but also with a few caveats. The mount is perfect and I love it. The smaller 8BitDo Zero controller works well but can cause hand cramps if gaming for a long time. Also, it’s missing a couple of shoulder buttons, which you might require for some games. Using the Steam Link App remotely has a few issues, though. You need a decent internet connection, and if you’re using your mobile data plan you might want to check your data allowance… If you have a less-than-stellar connection you will find issues with lag and dropped frames. It’s still usable, but you might want to play games that don’t require precise controls, such as puzzle or strategy games. UtorCase Phone Mount – prices vary but mine cost £17. Steam Controller – you can use any bluetooth controller, of course, but I love mine and it allows me to play more games than a regular one – £40. 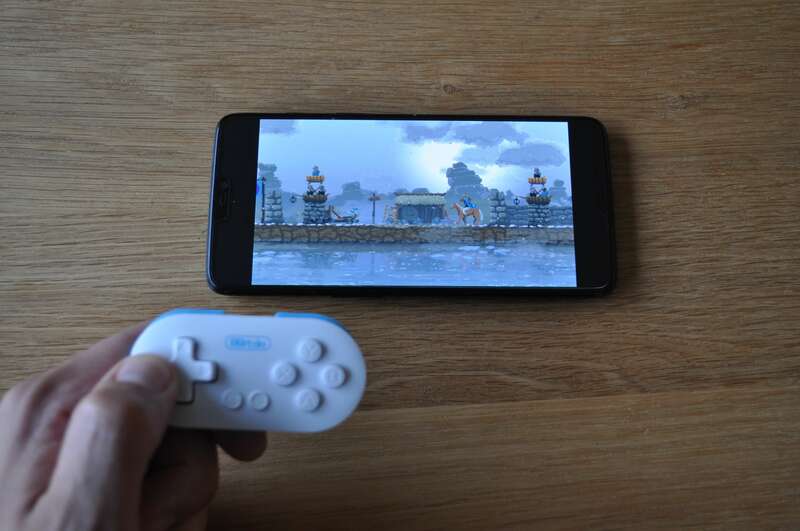 8BitDo Zero – more of a nicety than needed, prices vary by design – £6. Of course, I already had the Steam Controller, so my cost was just £23. Versus the Nintendo Switch that costs £280, I have saved a whopping £257! The 8BitDo Zero is great for less intensive gaming. Yes, it’s not a Switch, it’s not as elegant a solution as something that has been specifically designed to be a portable and flexible system, but it allows me to play anything from my massive game library anywhere at home and most of my games when out and about. When you factor in the cost saving, I reckon this quest has reached a successful end. Tried this too. For your first use case in the home, works great. For outside the home, not so much. If I happen to be at a friend house or something, and he has a 5GHZ router than it works well. 2.4 and the latency renders it unplayable. 4G or 4G hot stop, unplayable. I picked up a gpd win 2 and its fantastic. I cant see how the switch even comes close with the flexibility of the win.